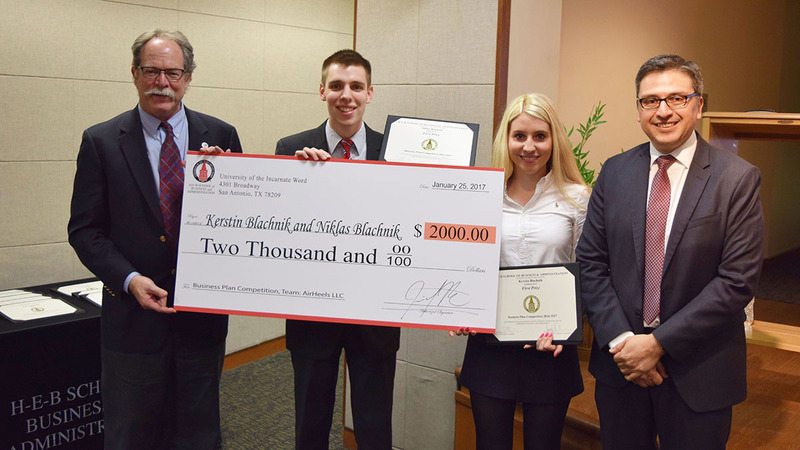 SAN ANTONIO – A brother and sister team took home first prize and a $2,000 check in the latest Business Plan Competition at the H-E-B School of Business and Administration. 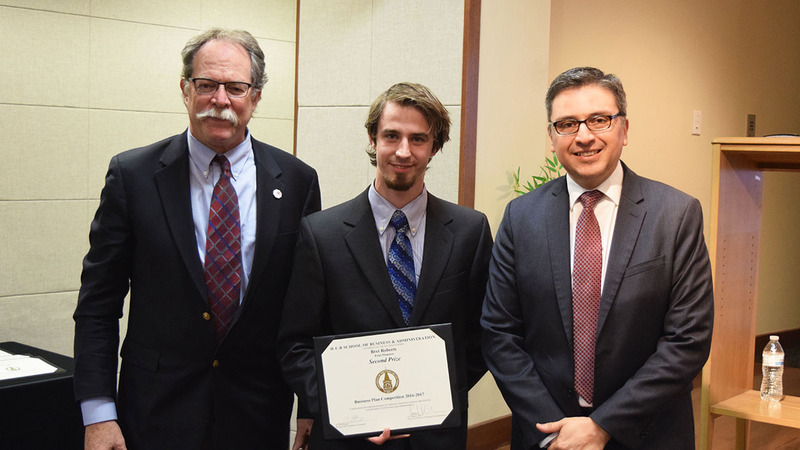 Kerstin Blachnik and Niklas Blachnik were honored at a ceremony in January for their startup company AirHeels LLC. The siblings’ product combines two staples of every woman’s closet: high heels and flats. Kerstin said it was her own experiences that led her to the idea. Kerstin, a German international student, is pursuing her Masters in Business Administration at the University of the Incarnate Word and a German Masters Degree at SRH University of Applied Sciences in Heidelberg, Germany. Niklas currently lives and works full-time in Germany while pursuing a Bachelors degree in Business Administration. The rules of the Business Plan Competition stipulate that each team may consist of one non-UIW student. Kerstin said the competition allowed her and Niklas to use what they learned in class to develop their business plan. The H-E-B School of Business facilitated workshops for the competitors to receive advise from experienced business professionals. Kerstin credits these workshops with helping her and Niklas create a successful business plan. Kerstin and Niklas are meeting with a representative from the Small Business Development Center to discuss the next steps for AirHeels, which includes finding a partner to support the production of a prototype. The second place winner was Bret Roberts, whose startup, Print Pioneers, earned him a $1,000 check at January’s ceremony. Print Pioneers is a startup technology company that intends to develop a more efficient print system to be incorporated in written materials with the purpose of improving its quality. The details of Roberts’ business plan cannot yet be shared publicly as he is pursuing exclusive patents.